I bought the beast on May 11th, 2015 from Hudiburg Toyota in Midwest City, OK. I had eyeballed it and a 2015 for quite some time. 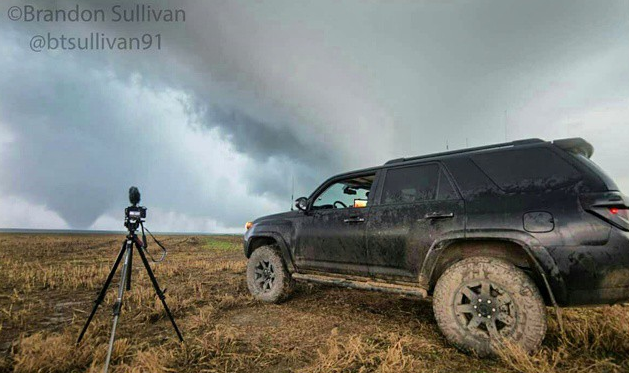 Of course, what is a storm chasing vehicle without electronics?? She’s a beauty Brandon! Based on your chases so far, what are the pluses & minuses that you’ve verified or discovered? How are those tires in the heavy rain, hail, clay backroads, etc? Oh, dude, it’s awesome. They plow through any mud, clay etc… It still slides in deep mud just like anything would.. About to get a winch and full new front end!